The Sea-to-Sky Highway and Whistler Area Offers a Unique Nature-lover's Paradise Away From the Busy City Life. The Sea-to-Sky Highway winds up the coast from Vancouver to Squamish and Whistler Village. This unique area offers an outdoorsy, nature-lover's paradise away from the busy city life. If you're looking for a recreational vacation property or resort-style living near to Vancouver, then you've definitely found the best place to live. Discover the Top Neighbourhoods Along the Sea to Sky Highway. The Sea to Sky Highway corridor is home to resort style communities and villages including Whistler, Squamish, Pemberton, Lions Bay and Furry Creek each with its own unique culture, lifestyle, and housing options. Below is a list of Inhabit Vancouver's top neighbourhoods in the Sea to Sky Highway, click on your selected neighbourhood to browse all real estate listings currently for sale. Lion's Bay is a neighbourhood which is located in the Sea to Sky Highway. View real estate listings currently for sale in the Lion's Bay neighbourhood. Furry Creek is a neighbourhood which is located in the Sea to Sky Highway. View real estate listings currently for sale in the Furry Creek Neighbourhood. Squamish is a neighbourhood which is located in the Sea to Sky Highway. View real estate listings currently for sale in the Squamish Neighbourhood. Whistler is a neighbourhood which is located in the Sea to Sky Highway. View real estate listings currently for sale in the Whistler Neighbourhood. Pemberton is a neighbourhood which is located in the Sea to Sky Highway. View real estate listings currently for sale in the Pemberton Neighbourhood. Sea to Sky Highway Houses, Condos and Townhomes for Sale. The Sea to Sky Highway real estate market offers some of the most affordable home options in Vancouver. Whether you are looking for a house, townhome, loft or condo for sale, you'll find a full range of housing options and neighbourhoods to fit your home and lifestyle needs in the Sea to Sky Highway. Sea to Sky Highway Schools, Local Amenities and More. Find the perfect place to live to in the Sea to Sky Highway for your lifestyle needs. Explore schools, shopping, recreation and local amenities. Browse community resources below or click on a link for additional information. The Sea to Sky School District No. 48 is unique in the diverse communities it serves. There are three major population centres: Squamish, Whistler and Pemberton. The District has high expectations for excellence across the curriculum—in academics, athletics, fine arts and career programs. Known for it's world-class ski resorts, restaurants and shopping, Whistler is the most popular destination for most people along Sea to Sky highway. But don't miss the quaint local village shops in other nearby areas including Squamish and Pemberton. The Sea to Sky Corridor is located along the southwest coast of BC, located just north of Vancouver BC. 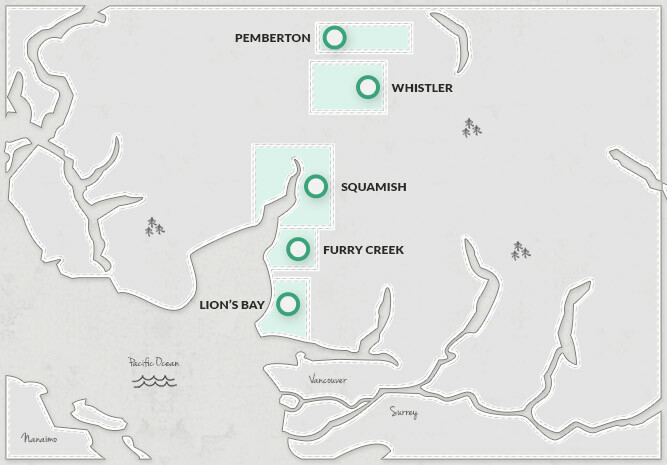 It includes the communities of Horshoe Bay, Lions Bay, Furry Creek, Squamish, Whistler and Pemberton. Interested in Buying in Sea to Sky and Whistler? We’re Here to Help.